Students meet with professional writers from 4 p.m. until 6:15 p.m. each Wednesday afternoon at Birmingham-Southern College. The first Wordsmiths class is always the final week of September, and class concludes on the final week of February. That’s typically 18 classes each year. There is no charge for the program. There are no grades. Instead there’s plenty of individual attention, a great deal of feedback, and a focus on each student’s particular talents. Each Wordsmiths class is divided into vocabulary, lecture, group exercises, and short writing projects. Every month, we focus on a different type of writing, from poems to fantasy to historical fiction to personal essay. At the end of the year, all students contribute to a class magazine. 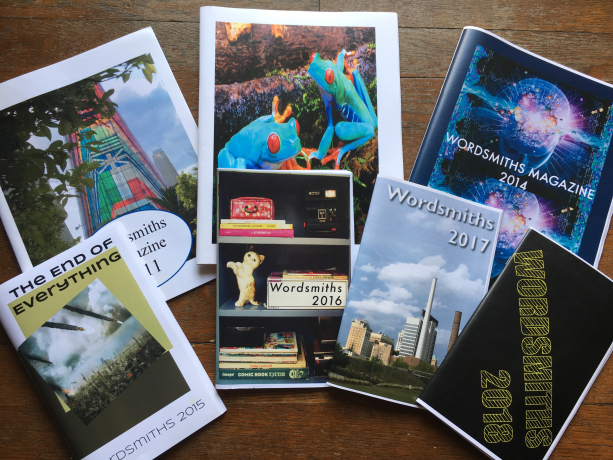 Wordsmiths couldn’t have come into my life at a better time. I’ve always loved writing, but Wordsmiths allowed me to improve as a writer in a way that my schooling could not. Mrs. Ginny was the first person to see the writer in me, and she did a beautiful job of bringing that out in a shy, quiet girl. Writing is still very much a part of my life, and I have Wordsmiths to thank for that.